While waiting for my appointment with AM Solar in Springfield, a suburb of Eugene, I opt to get out of town for a Sunday outing. 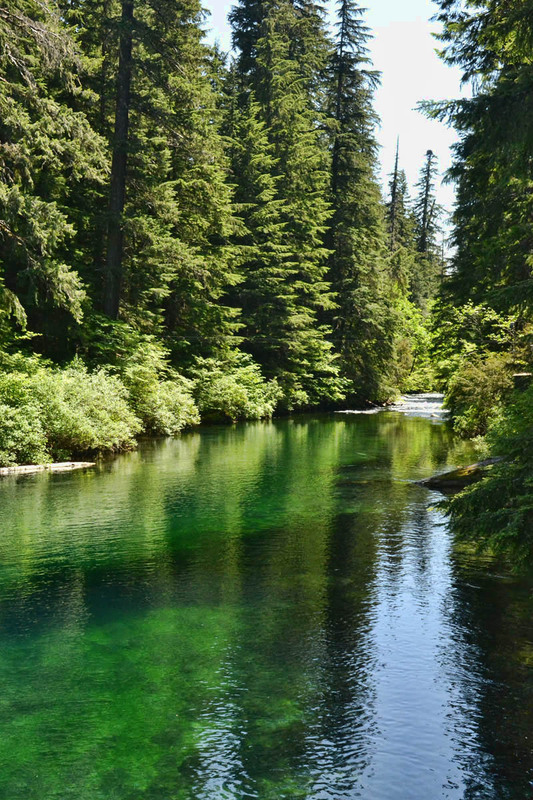 I have read about the McKenzie River Area, and decide at 65 miles outside of Eugene, it’s not too far for a day trip. I arrive at the McKenzie River Ranger Station and look at the giant billboard maps that point out all the scenic attractions around. With so many things to see and do in such a gorgeous place, I am over-stimulated. There is some sight or activity that strikes my fancy in all directions. I have long wished I could try mountain biking to see if this is something I could do while still keeping my teeth and tailbone intact. 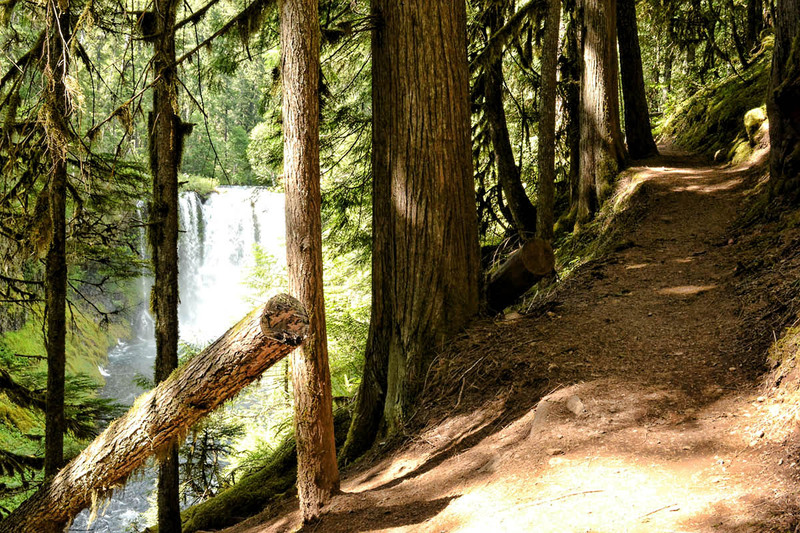 The scenic McKenzie River trail is billed as “America’s Number One Trail,” with 26 miles of “single track” running parallel to the wild McKenzie River. Commercial shuttles drop bicyclers off at any point along the trail according to skill level, affording a downhill ride all the way. I am dying to try this, but I don’t have the right equipment, nor do I have the right skills. So I continue along Highway 126 until I come to Clear Lake, a name that needs no explanation. 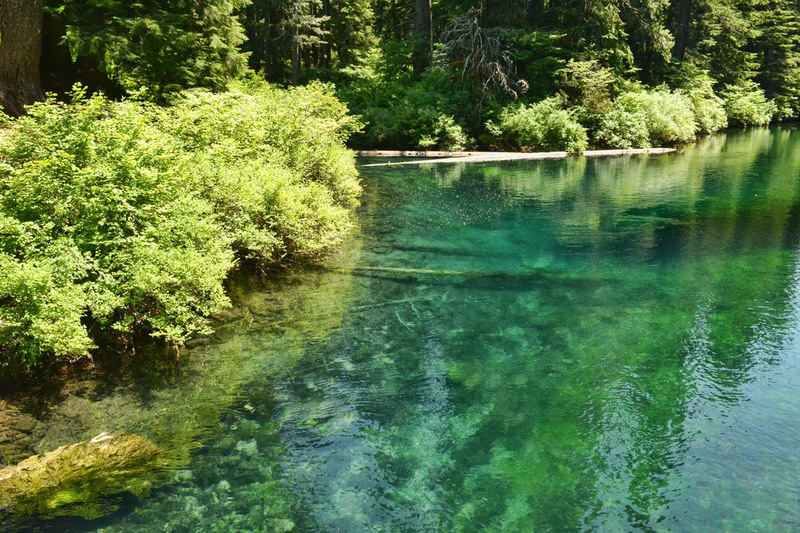 With 100 foot visibility, this is the Oregon SCUBA divers Mecca. 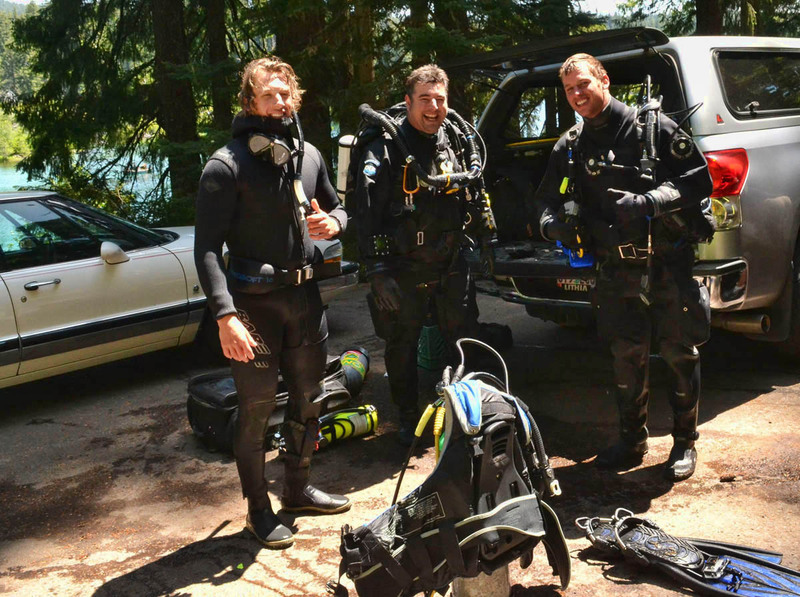 SCUBA diving in Oregon? Now that’s a novelty! I have the right skills, but I don’t have the right equipment…..anymore. 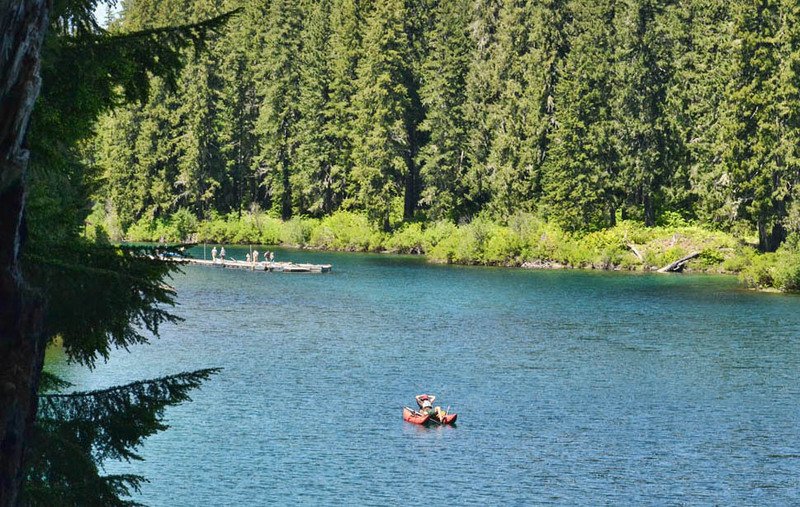 So how about a nice Sunday afternoon paddle on a perfectly serene, aquamarine lake? I have the right skills, AND the right equipment! I happen to have my Sea Eagle inflatable right in the back seat! But I don’t have the time. It would take me most of the afternoon to get the kayak out, inflate, paddle around, deflate, and store the rubber boat, just to see such a small area in this vast wilderness. No, if I must choose one thing and one thing only, I am sticking to the “tried and true” for which I have the right skills, equipment, time, and passion. In a place so eye-popping gorgeous as this, I will go for the Goldilocks of sport options. I’m going to hike till it hurts! As I start out the 5 mile trail which circles Clear Lake, I am reminded of all the Christmas Tree farms I have passed along the road. 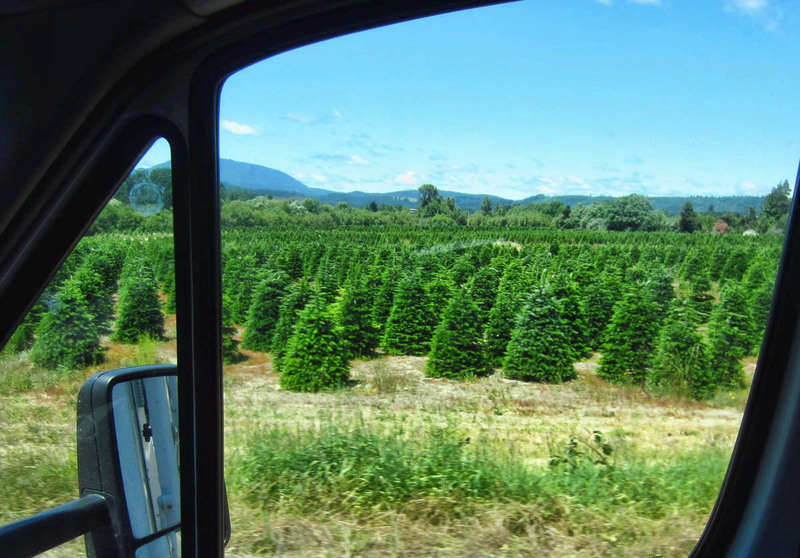 Oregon is our nation’s leading producer of Christmas trees! This sweet, fresh, nostalgic aroma permeates the path to the point that I must stop several times along the way, just to inhale. As much as I dislike everything the commercial version of the holiday has morphed into, I am still crazy about that scent! Clear Lake offers up one scenic vista after another, and I take so many photos it is ridiculous. According to wikipedia (which we all know as law) “The Lake is primarily fed by snow runoff from nearby Mount Washington and the surrounding areas. The runoff filters through underground caverns for more than 20 years before emptying into Clear Lake. 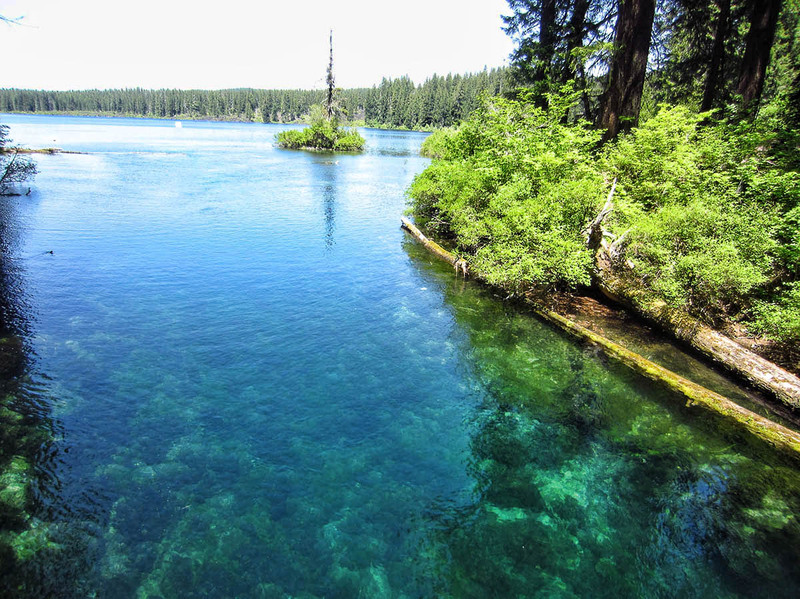 Clear Lake is the headwaters of the McKenzie River, which is the sole source of drinking water for Eugene.” No wonder I love it here so much. It reminds me of the caverns in the Florida aquifer where I did over 100 dives. The hike is just what I had hoped for…but I’m not done yet. 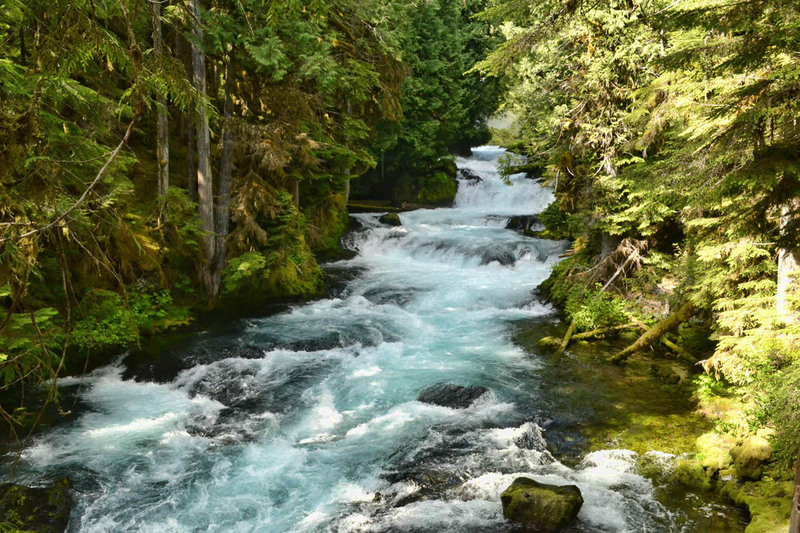 Just a few miles back down Highway 126 are two waterfalls, linked together by the breathtaking McKenzie River. 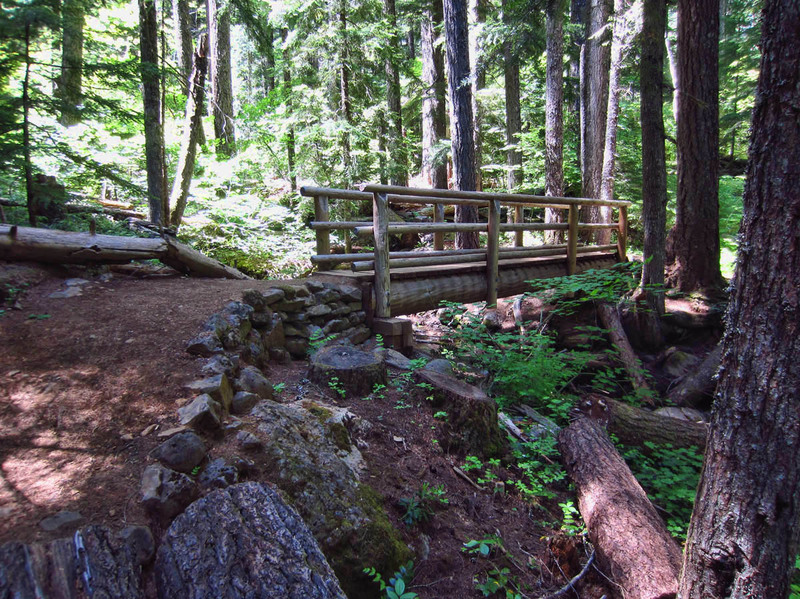 Though both are right off the highway, there is a one mile trail that links the two. 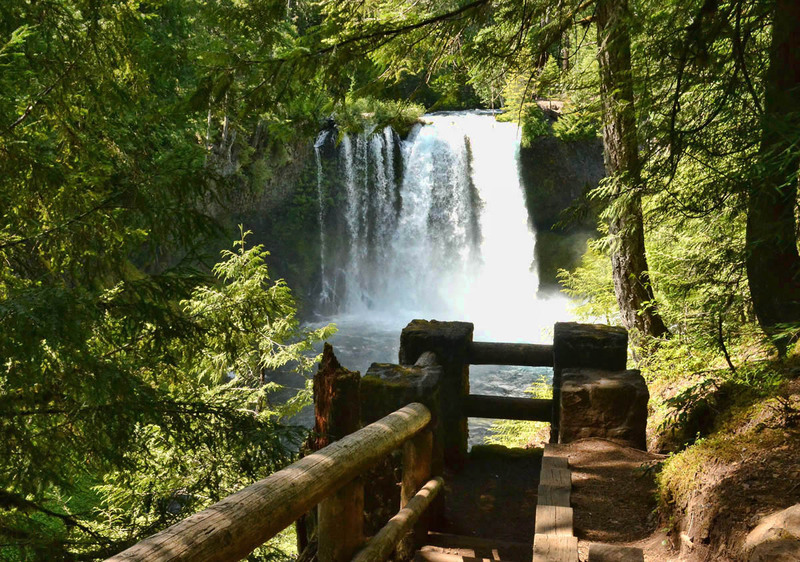 The falls are crowded, but it doesn’t seem as if many choose to make the hike in between, so I enjoy many stops along the path to soak in the sights and sounds of the raging river that links the two falls. It is cold and refreshing as I can feel the brisk air on my skin forced up by the swift river. 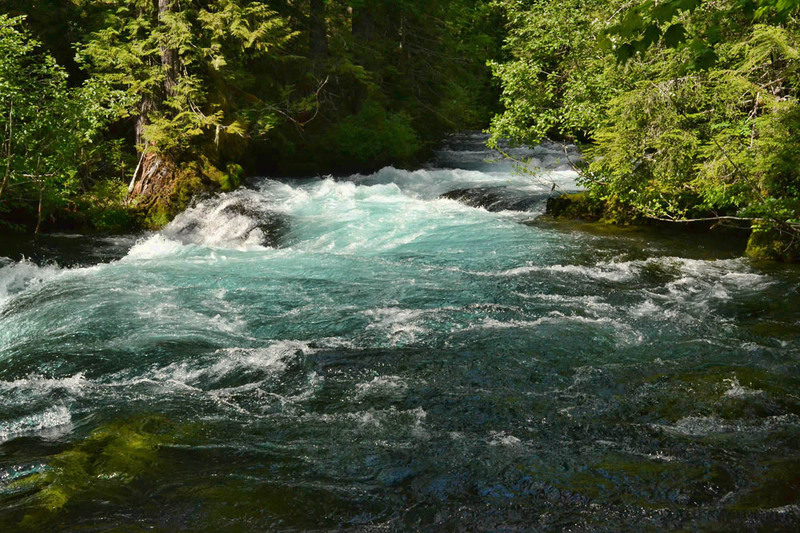 I marvel at how blue the water is, as I can see turquoise hints in the falls. 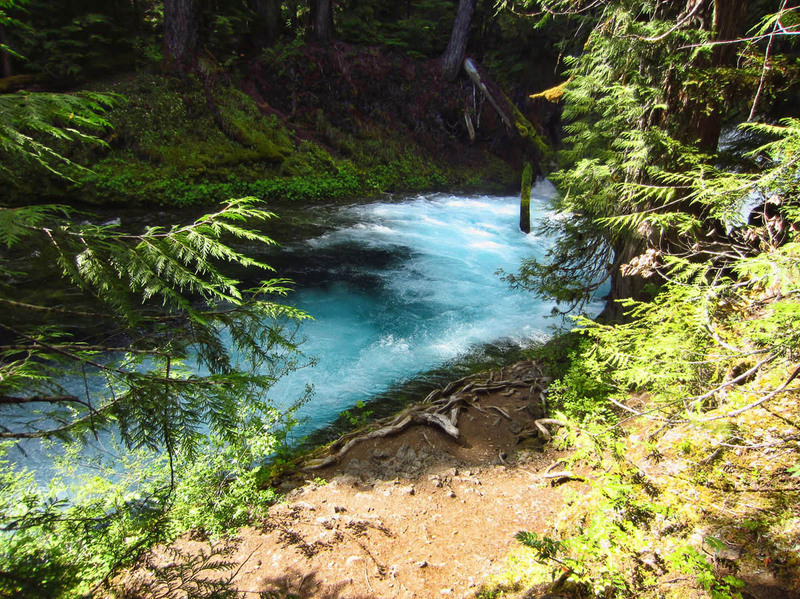 But the river itself is even bluer. Were it not for the white foam, it almost reminds me of those river rides at Six Flaggs with blue dye in the water. 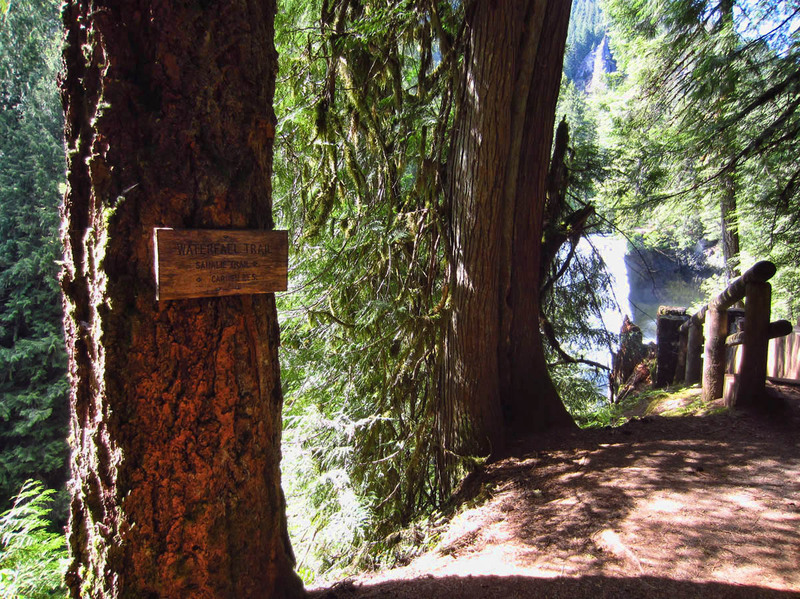 There is a 3 mile loop trail here, but I opt to cut it short and just do the 1 mile up and back between the two falls, because I want to leave enough time for one final stop that I have in mind. 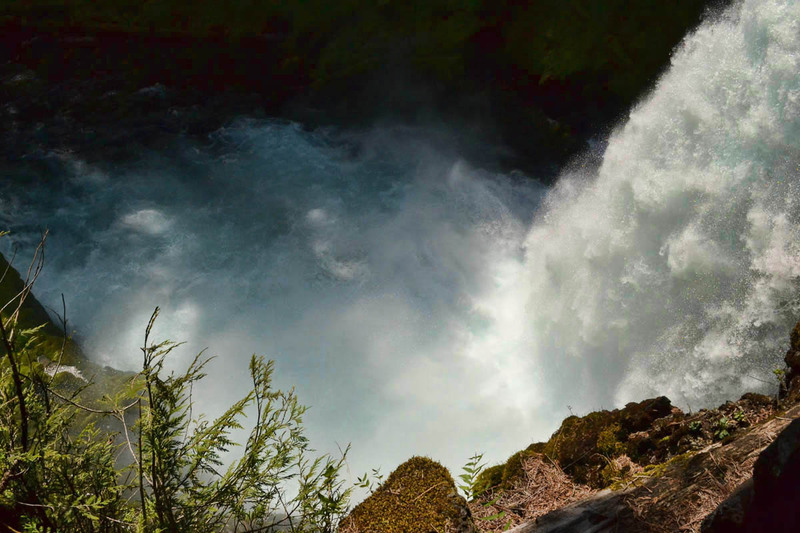 The uppermost falls, Sahalie and the lower Koosah Falls means “Heaven and Sky” respectively in Chinook Speak. They are left over lava flows that damned Clear Lake 3,000 years ago. I start at the Koosah Falls parking lot. It is a much less crowded parking lot, and I get the uphill section of the trail out of the way first. 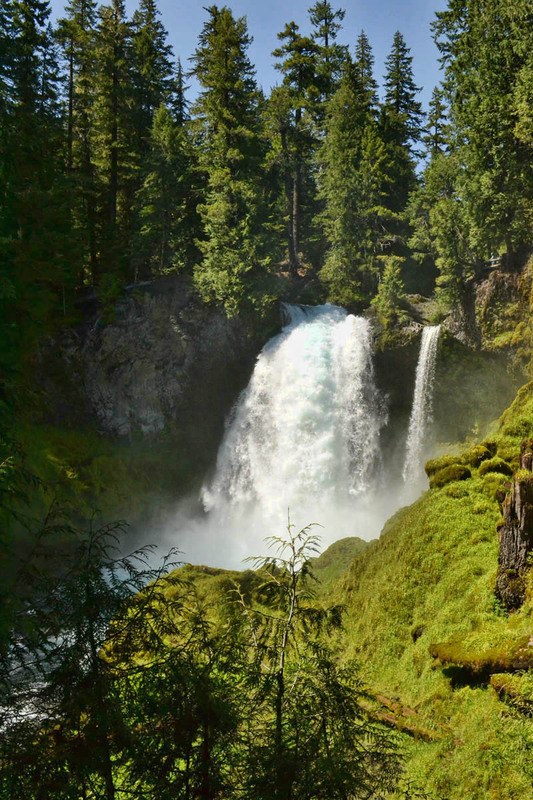 This entry was posted in Oregon and tagged Clear Lake, Koosah Falls, McKenzie River, Sahalie Falls by Suzanne. Bookmark the permalink. Thanks AGAIN! You have planned part of my fall trip. Did you see dogs on the trail? Oh my gosh, that’s gorgeous! 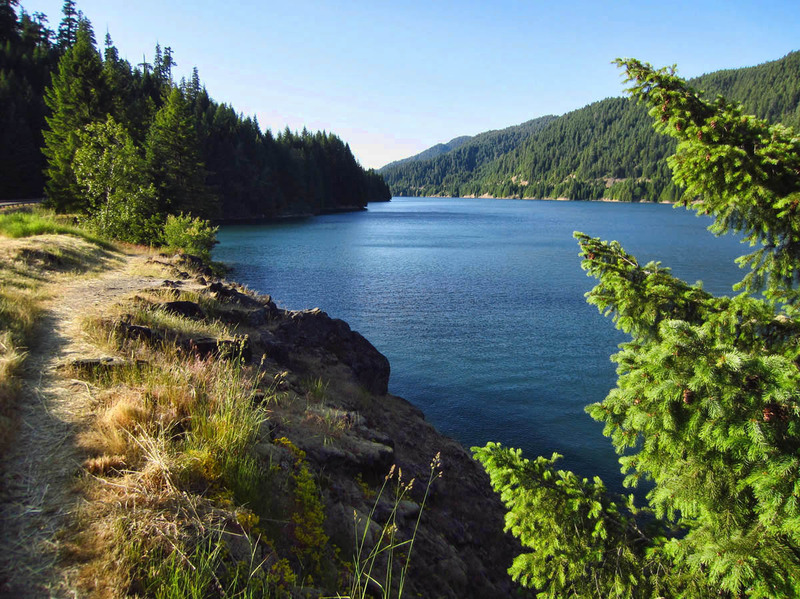 Ok, the heck with the coast, I’m headed to paddle Clear Lake and do this hike! Beautiful. Just beautiful. 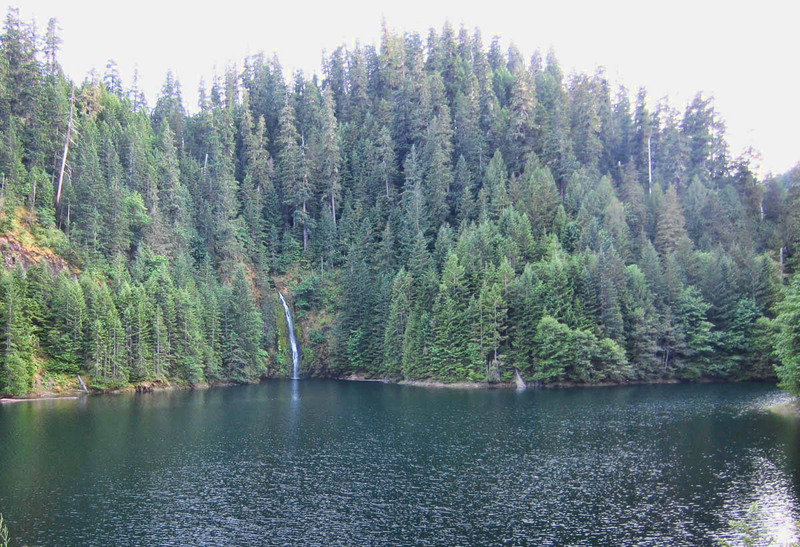 We used to pass a Clear Lake on our way to Oregon, but it was huge. I’m thinking this is another that I’d love to see. 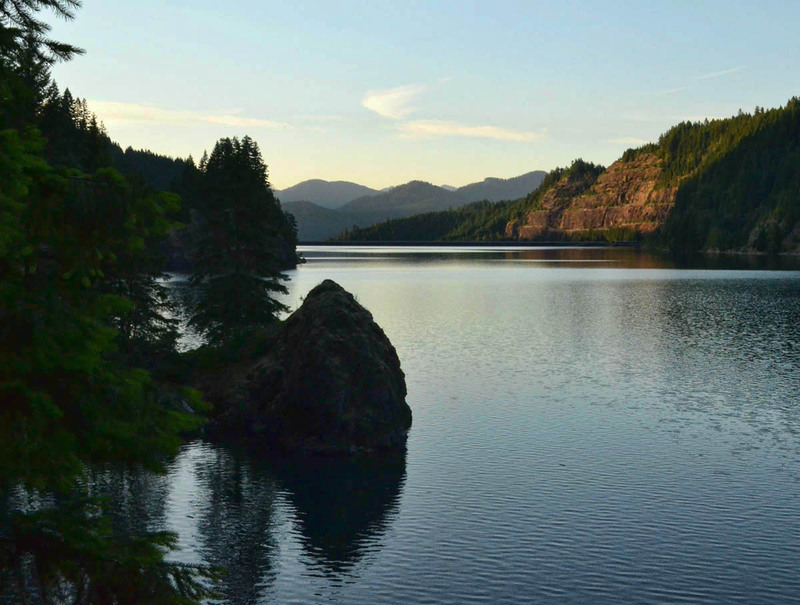 Oh, another place we need to visit in Oregon. We may make a day trip there before leaving Bend. Good for you hiking seven miles. Keep it up! 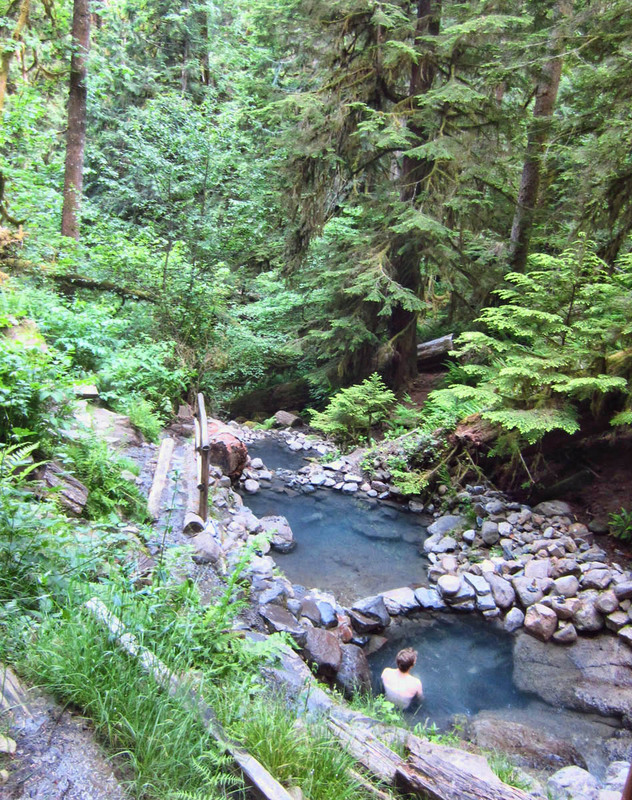 I’ve never been to the hot springs, I can see that it is definitely worth a stop! Thanks for putting it on my radar. Well you did it again. Fabulous pictures of a day I would definitely love. Beautiful hike and WATERFALLS!! But to end it with a soak in a hot springs is just cat’s meow as far as I’m concerned. Absolutely worth the drive. You do find the coolest things. I’m certain that I lost 2 lbs just reading this so that means you likely lost a ton more. Now you can have a fabulous dinner somewhere special. 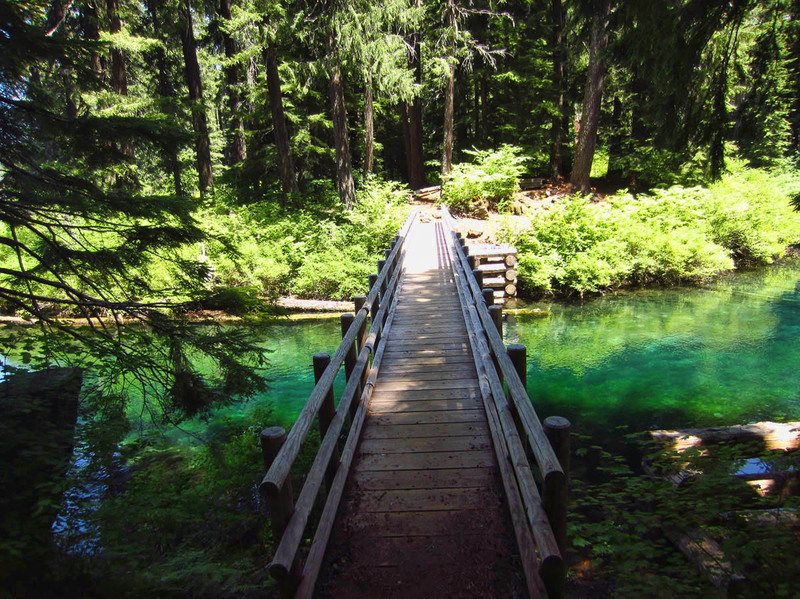 As always your photos are captivating, bringing us right into the picture and on the hike with you. Gracias! WOW! Someone today was talking about how amazing Hot Springs is. WOW! Know what you mean about being over-stimulated. Too many choices. Too much to process. It feels like it would take 2 months to find your way. (Which is probably about right for places like that). Like you, I stick with the simplest option – you can’t beat a pair of hiking boots and a day pack, IMO. Those have to be some of the most beautiful pictures I have ever seen! Wow it’s nice to see that somebody knows how to preserve an area (said by someone who lives in the midst of cement plants, coal burning power generators, steel smelters, fracked gas spewing water wells, strip malls and Olive Gardens – all intermixed along our dry and flat land of Texas). I hear they are auctioning off Detroit …. Texas has surely got to be next! Time to move to Oregon! One of my favorite spots as well and wasn’t that hike at the falls AMAZING?! It was one of my favorite waterfall hikes of my vacation in May and am so glad you got there. 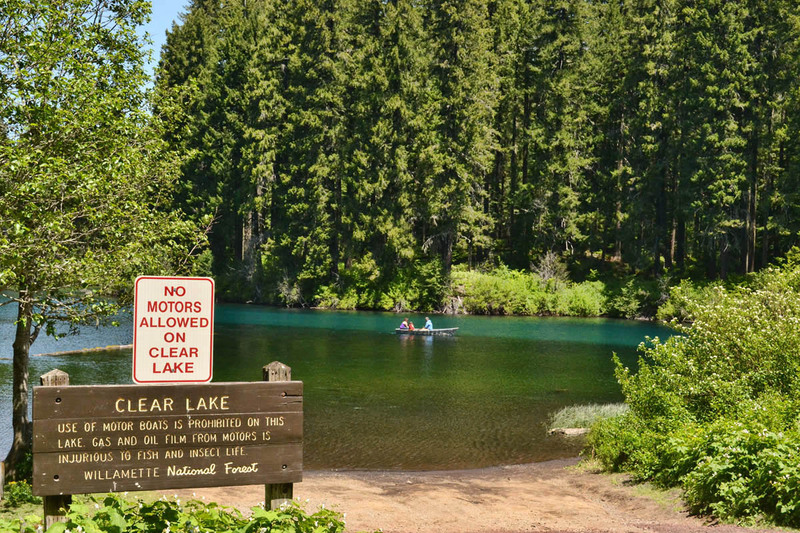 I would have loved to hike around Clear Lake – next time! 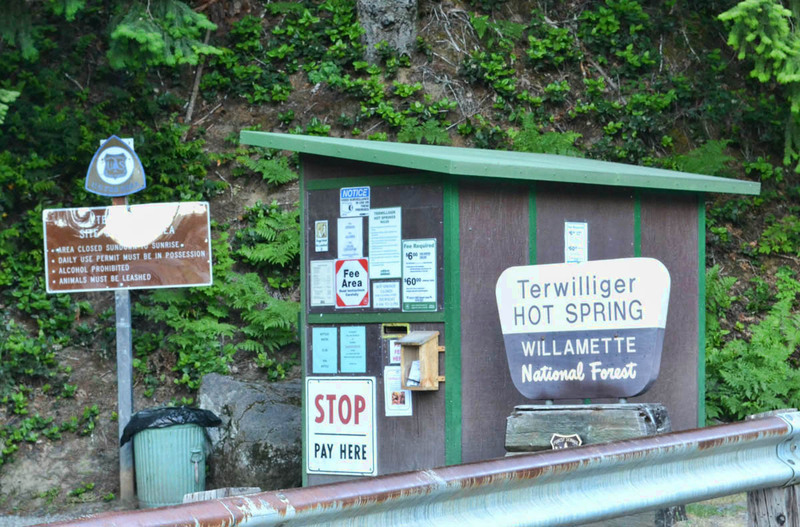 We also love to stop at natural hot springs. What a find! The hike pictures were amazing. Hiking is my favorite. 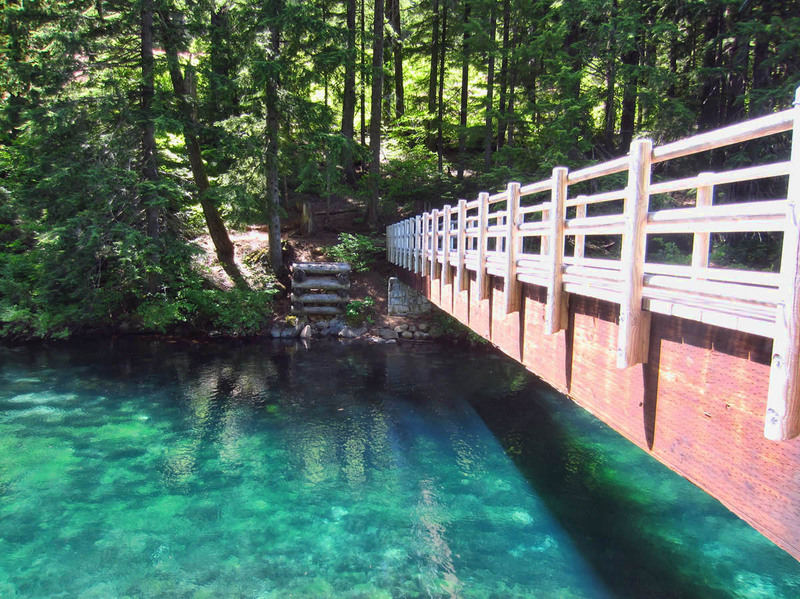 We have added this hike and hot spring to our “must see” list. Thanks for sharing. I love it all, but most of all the waterfalls. Makes me want to get the canoe out and take a ride. Once again, thanks for sharing your beautiful pictures. swade — Thanks for the comment. I have tried so hard to remember if I saw dogs, but I just can’t recall. Sorry! I didn’t see anyone except one couple on the Clear Lake trail. The waterfalls were crowded, but not the trail in between. So I just can’t remember, but I do know Oregon is very dog friendly! 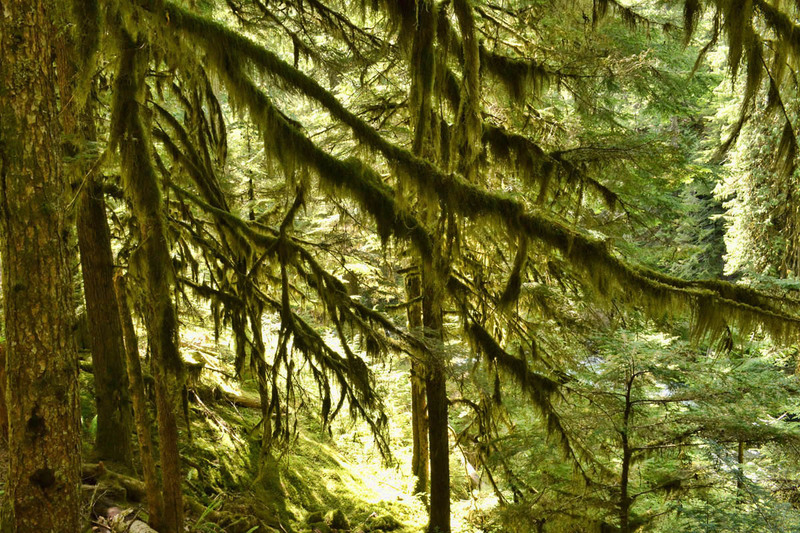 You might give that Forestry station in McKenzie River a call. It was a huge office, just closed on weekends. Hobopals — Yes, this was a very small lake, though it sure preceded a mighty river! Jim & Gayle — The junction with 20 was very close to the lake. I think I got as close as 50 or so miles from Bend, so you should do it before you leave. 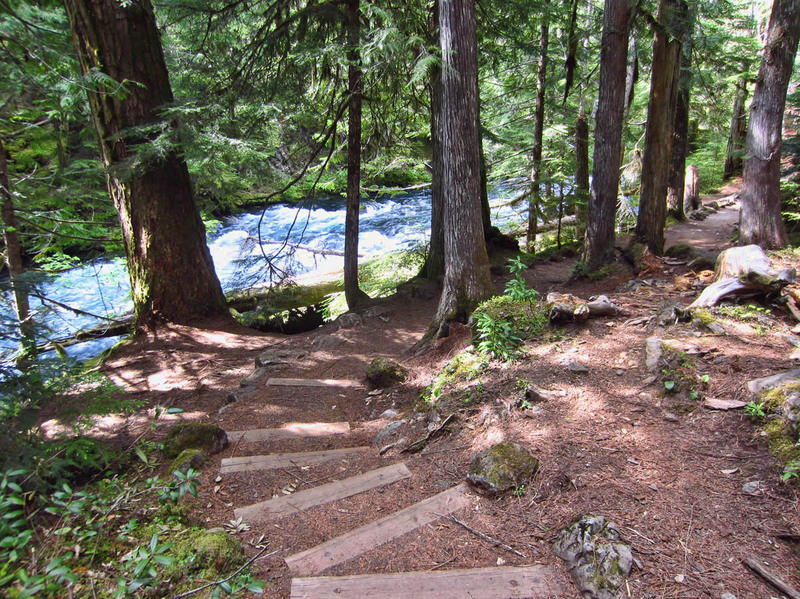 I believe that bike trail runs right along the falls and river…just on the opposite side of the hiking (ped only) trail. BC Mark — It was, indeed. Carolyn — I knew you would like my three photographic subjects. Black neoprene does it for me every time. LOL!! Lisa — Great link, thanks! I wish I had spent more time there. There were lots of campgrounds, I just didn’t check to see if any were for RVs, but could definitely have spent a week there! Contessa — Trying to work off all those good dinners I had back in Newport! ugh! Kim — I know you are enjoying having some “guides” built in to the WIN itin to help make these choices! Don Don — Definitely a place you would love, without any doubt!! Sherry MT — Yes, it was one of my favorite hikes so far. Loved the colors, the sights, the sounds, the cool temps! Karen — Thanks so much for the nice comment, and for following along! Allen — Yes, I have a feeling my decision not to kayak that lake is gonna haunt me…My best to you and Deede.